Property 19: Extraordinary apartment with bedroom in the original hay barn! Property 21: Relaxing holiday surrounded by nature far away from the hustle and bustle. 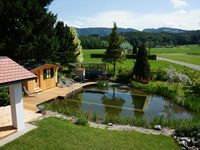 Property 49: Holiday of a special kind in the famous Styrian Schilcherheimat! Klaus and Ingrid were excellent hosts and the apartment is excellently furnished. Highly recommended if your travels take you to this beautiful area of the world.